MUNICH, June 21, 2018 /PRNewswire/ -- Sungrow, the global leading inverter solution supplier for renewables, presents 1500V solutions with string PV inverters, central PV inverters, and ESS as its hero products for Intersolar Europe 2018 in Munich, Germany. The 6.8 MW turnkey solution for 1500Vdc systems features block monitoring, auxiliary power supply, and Night Static Var Generator function with SG3400HV. This enables significant savings of initial investment and future operating costs. Developed for large-scale utility plants, SG3400HV also features a high DC/AC ratio of 1.5 with maximum inverter efficiency of up to 99%. For up to 5 MW power block design, the 1500Vdc SG125HV received UL 1741-SA certification, is the world's most powerful 1500Vdc string inverter, features a high capacity of 125kW. Additionally, it is proven to work stably in full power operation without derating at 50 degree celsius, maximizing the return on investment for project owners. Committed towards providing integrated energy storage system solutions for residential, C&I and utility scale applications, Sungrow showcases the 4MW/2.134MWh system which consists of one PCS container and one ESS battery container. This system can be applied to frequency regulation and peak-shaving uses. It complies with TUV standards and its battery is supplied by the Sungrow-Samsung SDI joint venture. Thanks to its containerized design, the ESS is flexibly configured at customers' requests. Sungrow's ESS is continuously recognized throughout the European market with over a dozen of projects installed in Europe last year. Earlier this year, Sungrow has announced that it won a deal supplying solutions for a 20MW/10MWh project in Germany. In addition, Sungrow showcases the flagship storage inverter SC50HV which has the maximum efficiency of 98.8%, and commercial PV inverters such as SG80KTL-20. 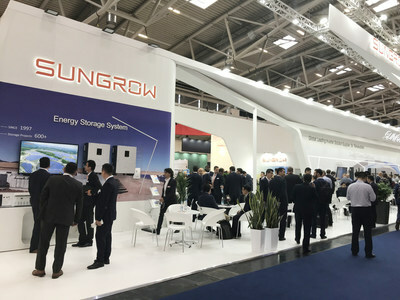 With advanced and complete product lineup, Sungrow demonstrates its strong R&D capability and commitment to the market as a global leading inverter supplier at Intersolar Europe. "Sungrow is committed to technical innovation which drives our rapid growth. We are delighted to offer better products and services to customers all over the world", said Professor Renxian Cao, Chairman of Sungrow. Sungrow Power Supply Co., Ltd ("Sungrow") is a global leading inverter solution supplier for renewables with over 60GW installed worldwide as of December 2017. Founded in 1997 by University Professor Renxian Cao, Sungrow is a leader in the research and development of solar inverters, with the largest dedicated R&D team in the industry and a broad product portfolio offering PV inverter solutions and energy storage systems for utility-scale, commercial, and residential applications, as well as internationally recognized floating PV plant solutions. With a strong 20-year track record in the PV space, Sungrow products power installations in over 50 countries, maintaining a worldwide market share of over 15%. Learn more about Sungrow by visiting www.sungrowpower.com.